I landed a new job in September! I had relocate to make my commute bearable. With the entire move I have been lax with my investments. Additionally, I had to increase my cash positions to handle moving expenses. All this had a positive effect on my interest income (there is always a silver lining!). I got $325.64 in dividends in my taxable account. My Roth IRA continues to grow albeit slowly. I received $30.61 in dividends in my Roth IRA. Unlike Q2, this was a weak quarter for my international ETF (VXUS). The US dividends are spread equally between my value fund and S&P 500 fund. My S&P 500 contributed the maximum dividends (32.92%). 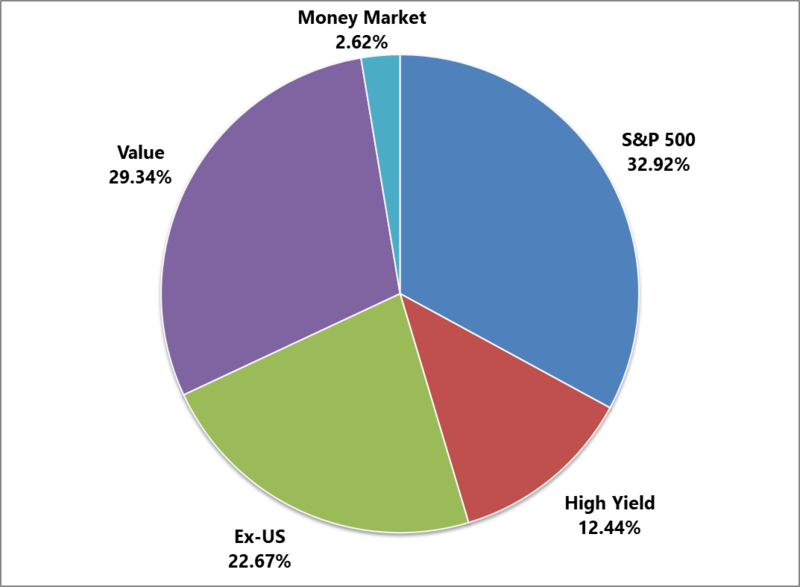 High yield fund (VYM) is catching up real fast and I am happy to see a double digit (12.44%) contribution. All together I received $356.24 in dividends in 2018 Q3. 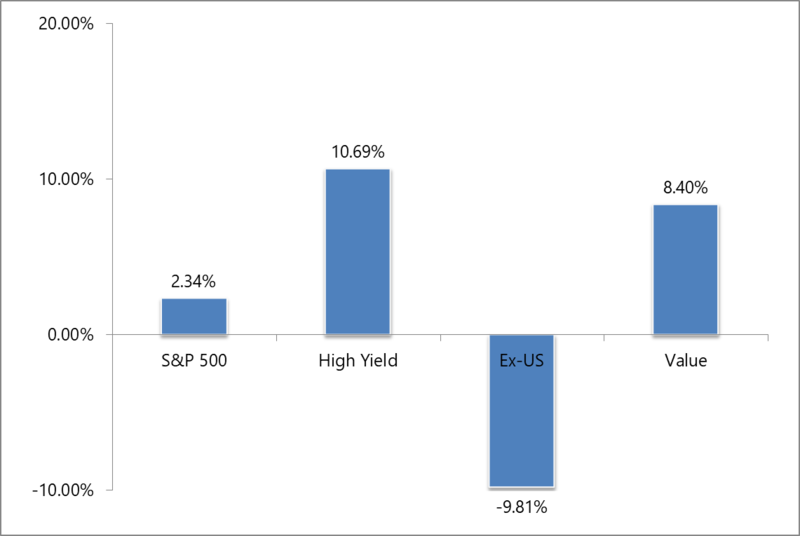 With the markets being relatively stable in Q3 I was not able to buy ETFs at lower prices. This has directly impacted my forward dividends in Q3 (and Q4). The strong dollar has definitely helped with scooping up international stocks at discount. 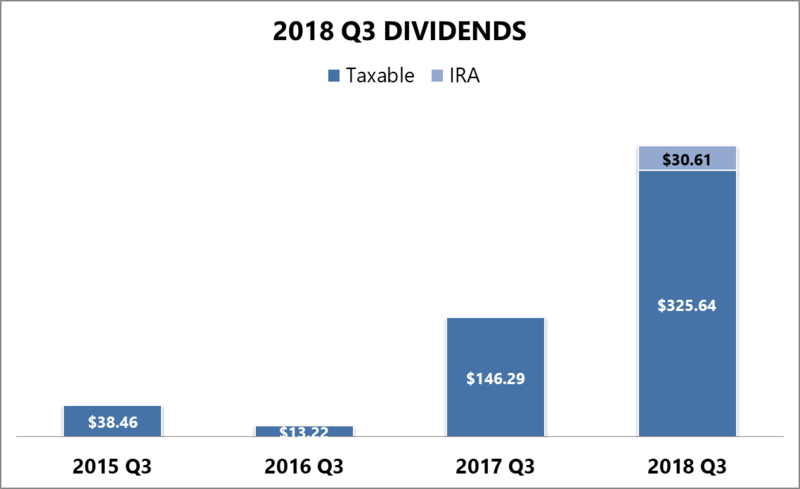 My dividends of $356.24 represent a healthy 143.52% increase from my 2017 Q3. Typically there is at least one ETF which pays a lower dividend than the previous year. My international ETF (VXUS) had a 10% drop in dividends as compared to 2017 Q3. But, I am not too concerned about quarters as on a yearly basis my portfolio tends to have strong dividend growth. My high yield ETF (VYM) leads the way with a 10.69% increase in dividends. On an average I had a 2.90% increase (organic) in dividends. International ETF continues to be an area of concern. 2017 was a spectacular year for my international ETFs. My profit from VXUS has pretty much returned to zero. However, this provides me opportunities to buy more. I am going to scoop as much as I can. 2018 has been a great year for passive income. Dividends are but one source of my passive income. In addition I generate additional income through Vitality, credit card (cash back), Swagbucks, TopCashBack and raise. 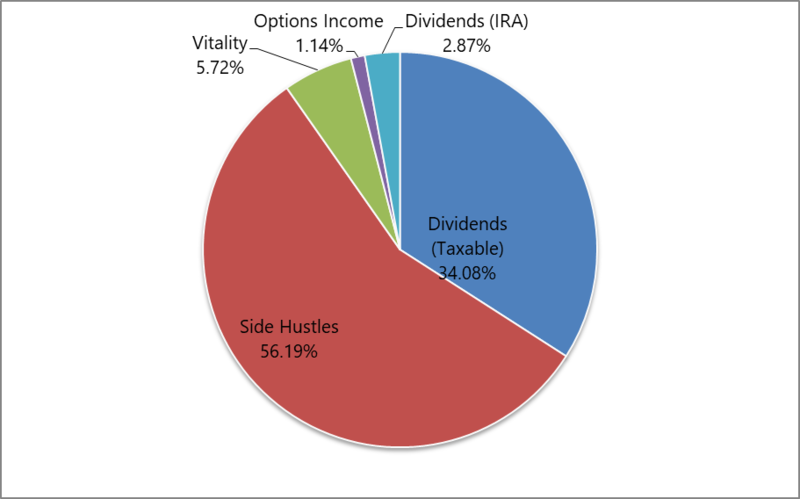 I categorize my (Roth) IRA dividends as a separate source as I do not have immediate access to it. As of September 2018, I received $2,589.92 in passive income. Side hustles lead the way and accounts for 56.190% of my passive income. A new entrant to my passive income strategy is options income. I sell covered calls on my long term ETF positions to rake in additional interest income. As of now it is a very small portion of my passive income (1.137%). That’s it from my side. Q3 has been awesome and life changing. With new location and job I don’t have the same amount of time I used to have. I will be providing periodic updates on my progress to FI. congrats on the new job and move. Is the state your moving to cheaper for cost of living? Like you said the rise of the us dollar creates a good opportunity to buy international etfs. so Thats huge, take advantage of the dip if you can. Im sure your costs for the move/ transition havent Been cheap. Your blog is too informative. Keep sharing your post in future too.I think people should acquire a lot from this weblog its really user pleasant. So much great information on here . Congrats on the new job Geek. It must feel really good to be done with all that moving. In look at the graph, that's also a nice increase in Q3 as compared to last year. Now, let's finish the year strong!